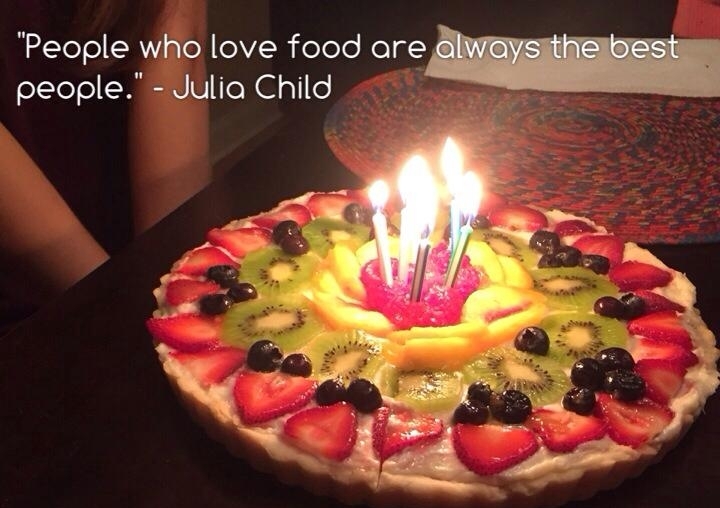 This couldn't be easier, and it is such a beautiful dessert to share with your family/friends. You could spend an awful lot of money at a bakery for this, and you can make it for much, much less! The crust is an old, Southern favorite, and you need a tart pan for this, for presentation! If you have a food processor, combine butter, powdered sugar and flour and process until ingredients come together to form a ball. Remove and press into a tart pan (12 inches), pressing against the bottom as well as up the sides. If you do not have a food processor, you can blend these ingredients with your hands until well-incorporated. Bake at 350 for about 13 to 15 minutes. Set aside to cool. Beat cream cheese, sugar and orange zest. Spread on top of cooled crust. On the outside circle of the tart, place the sliced strawberries in a circle on the outer layer of the tart. Next, sprinkle blueberries on the next "circle layer" and filling in any gaps. Third layer, place sliced kiwi in a circle, again filling in any gaps with the blueberries. Close to the center, group the sliced peaches close together in a circular formation, then pile the raspberries in the very center. If you see any "gaps" where filling is showing, just use the blueberries and/or raspberries to fill that space. Take about 2 large Tablespoons of orange marmalade and melt it in a microwavable bowl for about 15 seconds. Using a pastry brush, brush the top of the fruit tart with the melted orange marmalade. This makes the tart shiny and beautiful! Slice as you would a slice of pizza or a pie, and enjoy!